Lately, the preponderance of uber clone taxi apps has been astounding. The lucrative on-demand taxi booking market has attracted both existing taxi players and newcomers, and the crux of surviving this competitive storm is an effective uber clone taxi app. So how do you develop a taxi app for your business and what are the winning qualities of an app like Uber? Let’s find out. Many businesses blindly follow the footsteps of taxi-hailing giants and expect to receive the same level of success. That’s where they are horribly wrong. It is crucial for business owners to analyse the target audience, competitors in the particular area, business goals to be achieved, the platform on which the mobile app needs to be built, and the purpose and outcome of the mobile app. Once you have a clear idea for all the above scenarios, you are good to go. Delivering a top-class passenger application is the deciding factor for the success of your business. This is where your audience will avail the services and, hence, it must be equipped with all the essential features required for a smooth booking experience. 1) An easy taxi booking interface where users can hail a cab by choosing their preferred car model and other extensive options. 2) Fare estimates for the destination before the users book a taxi. 3) GPS tracking to know the driver’s current location and the estimated time of pickup. 4) Multiple payment options including wallet system. 5) Push notifications to update users on ride confirmation, ride details, driver name, vehicle model, color and number on the plate, estimated time of arrival, etc. 6) Messaging and call feature to communicate with the drivers to discuss ride details. 7) Driver reviews and ratings to allow users to share their ride experience and examine other users’ feedback. 1) Trip request notifications where drivers can accept or decline a request easily. 2) Push notifications that provide user details, including pickup location, drop off location and more. 3) GPS navigation that allows drivers to reach the destination quickly, without losing their way. 4) Detailed reports on daily trips completed, income earned on a daily/monthly basis and more. While there are certain prerequisites for an Uber clone taxi app, there are few emerging industry trends that have become quite popular. Features such as geofencing and surge pricing have been adopted by many taxi owners. 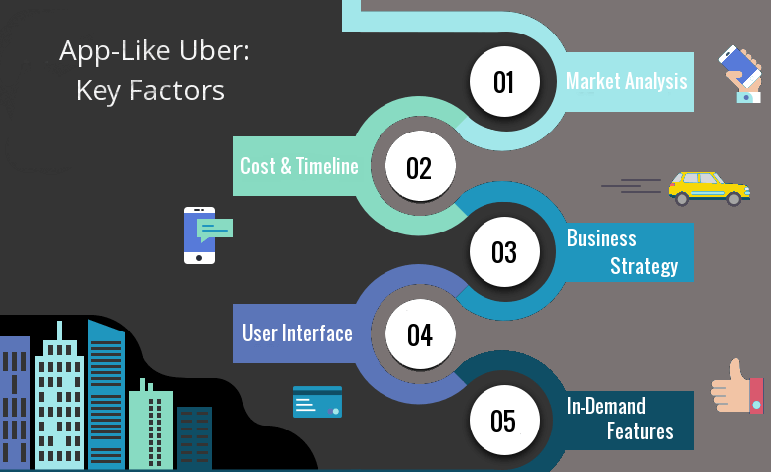 Do consider these in-demand features while developing the uber clone taxi app. The development cost and timeline required for building a taxi app like Uber depend on the complexities and the level of advancement your business requires. Typically, it would take up to 300-450 hours to develop an iOS uber like app and an average 350-400 hours to build an Android taxi app. Cost-wise, both the applications would be an average of $6,000 – $9,000. However, this largely depends on the company you choose to develop the application, your requirements and other crucial factors. Tagmytaxi is an on-demand taxi booking application providing taxi owners the right platform to scale their business by taking advantage of all the crucial features of a taxi app like Uber.